"This is the cold-process method for making a shrub. This is one of those 'don't have exact measurements' recipes, but if you get the ratios close, it is hard to mess it up. Although I'm usually a fan of using fresh ingredients, frozen fruit/berries actually work well and sometimes give a little more juice (don't tell!). 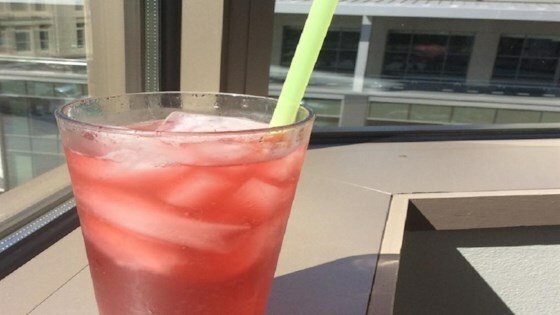 I combine the shrub with sparkling water to make a nice soda. It can also be used in cocktails and salad dressing." This apple-ginger flavored drinking vinegar is refreshing and original! Use any berries or stone fruit you prefer; if frozen, make sure to let fruit thaw. Strawberries should be hulled and quartered. Stone fruit should be quartered and pitted. White granulated sugar provides a neutral sweetness; brown and raw sugars may also be used. A number of different types of vinegar can be used as long as it has at least 5% acidity. Distilled white vinegar has more of a clear, sharp flavor, while apple cider vinegar will be milder with a fruity flavor. Wine vinegar will have a superior smooth flavor. Balsamic vinegar is great with cherries and strawberries. Feel free to use any herbs you prefer.